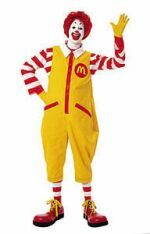 As if people needed another excuse to hate clowns, McDonald's has decided their mascot Ronald McDonald isn't projecting quite the image that they want. So to freshen him up they're giving him a closer-cropped haircut and clothes that show off his lean, trim figure. He's also going to be more active in commercials, playing sports and encouraging kids to join him. Hey, if you want people to believe your food is healthy, you can't have a fat clown peddling it. Thankfully my baby isn't old enough to demand a happy meal yet, but I know that day is coming. I just hope when she's old enough to make her own decisions about food, she'll make the right ones.